After spending time in Arizona for Wasteland 2, Fargo is happy to tell us how the new setting, Colorado, fits into the lore. “The idea was that the Rangers [the dominant faction in the Wasteland] wanted to expand their territory and bring law and order not just to Arizona, but to the rest of the States. But does this explanation *actually* allow the move to CO fit into the lore? In WL2 the Rangers were apprehensive to police their old territory in AZ. The eastern portion had been taken over by the Red Skorpions as a result. Now they want to police the rest of the states, when they can't even police their own state? I hope there's a good explanation for how this small group goes from barely able to handle their own backyard to thinking they can protect "the rest of the states" as well. On the surface this sounds like this actually does not fit the lore well at all. Once the floodgates open I guess. That is not a concern to me story wise. It makes sense in a way they already starting with scouting other areas, it becomes a bit of a situation of grow or someone else will. It will be a chosen one game. That was also confirmed in this interview. So let's hear it from them. All official like. Not just from some interview. Yeah, that sounds pretty chosen one to me. Hey. Brian. If you used LEARN BY DOING, character creation wouldn't be this huge bugbear you're apparently terrified of. Glad I didn't go nuts with my pledge. marceror wrote: I hope there's a good explanation for how this small group goes from barely able to handle their own backyard to thinking they can protect "the rest of the states" as well. Maybe we were a splinter group who left because Vargas is a pants-on-head moron who probably needs help tying his boots. I wouldn't take orders from him either. In the event that others read the replies here and do not realize that inXile posted further clarification in another topic, this game really will be party-based, but the player begins the game creating only one ranger; later, the player will create more rangers, and if the first created ranger dies, the game does not end. sear wrote: Hey guys, thanks for voicing your thoughts. However, you are reading too much into that interview. In Wasteland 3, we're still building on Wasteland 2's party-based system and giving you the ability to create and customize Rangers. The main difference is we're planning for you to start out as a single character, before forming a full party out of created characters and companions. paultakeda wrote: And if that single character dies but one or more of the party created later do not, does the game end? You can still continue playing if that character dies. Hope somebody has a copy. What is your biggest ambition with regard to Wasteland 3? Fargo: I’d like the post-apocalyptic RPG crown back [laughter]. I think there is an opportunity with what we are doing with the Wasteland series to really cement our affinity to that little genre, which I grew up with and loved. I think the Fallout series has perhaps become a little too monster oriented. With me, I’m more into The Road, Swansong and The Stand; I like those aspects of civilisation breaking down and what it means from a real personal, human level, I find that fascinating. And so Wasteland 3 is more focused on that than, say, monsters – and of course we do have sci-fi elements because that’s what the Wasteland series is about. Then we have the multiplayer aspect, which is going to be great and we are going to do some super clever stuff with that. Fargo: What we find is that most people, when they play with a friend, don’t want to destroy the experience for the other person, they just want to tweak it a little–maybe get them arrested or thrown in prison or something, but they don’t want to kill them off. It would look like that RPG crown you want back is very much within your reach then? 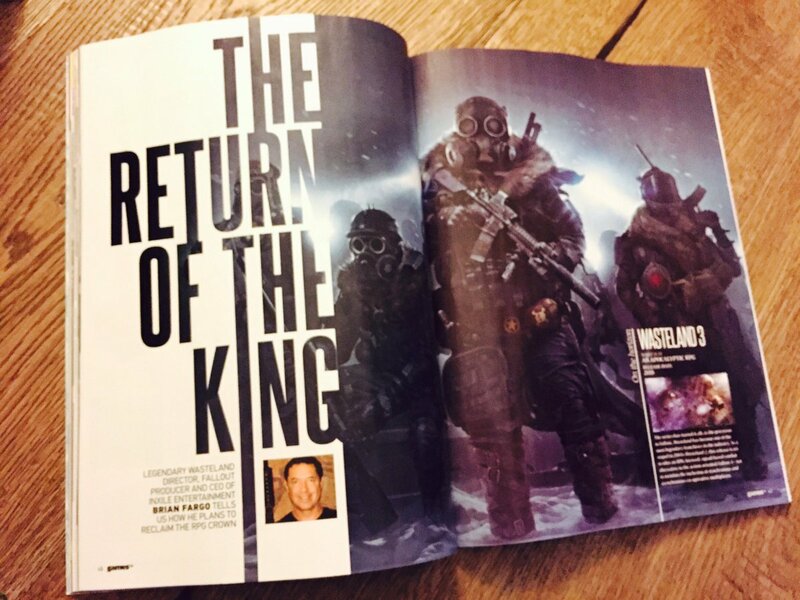 Fargo: We are really trying to deliver on [Wasteland 3] and, like I said, isometric is great for combat but it…in our reveal trailer, you’ve seen that conversation [in first-person] with Fish-Lips and it changes everything. Your connection to that guy changes everything and sowhen combat goes back [to isometric], that person is farmore real now that you’ve seen themup close and heard their voice; that changes the dynamic and that’s what the immersion aspects of first to third person does for you. It’s the same reason that Blizzard spends millions of dollars on those opening movies, because its characters become more real… they have a whole different vibe having seen [them] in the opening movies. The tradition with sequels has always been to go bigger and go bolder, but is there a risk of a shortfall when you’re relying so heavily on crowdfunding to dictate a budget? Fargo: I think that a lot of things go wrong with [sequels] when they try to go bigger… I think that a lot of projects can go sideways in this [mentality]. With Wasteland 3, we aren’t making it as big as Wasteland 2; only like five per cent of players finished Wasteland 2, so I’d rather have less maps and go far more detailed and tighter than I would to go bigger and bolder, I don’t think that buys you anything. But the bigger part for us is the visuals and that is things like the camera coming down for conversations, but that’s sort of a different attack. I think the mistake people often make is that they say,“Well now we need twice as many weapons, twice as many maps, twice as many…” But it’s the personality that you remember, it’s the moments and the charm; it’s the craft that makes these things special, not the size. We are going much narrower, tighter and smarter. How important do you think visual fidelity actually is? It seems to be a big focus for your next three games? Fargo: [There is] a new generation of people, that’s why we need to improve the visuals. They aren’t going to be all nostalgic about it, they aren’t going to give us a pass; we better show some better stuff because all they are going to know is Witcher or Dark Souls. They will allow a certain amount of variation – visually speaking – but the closer the gap the more we are likely to get the audience to want these things. We want to sell the most units, and why do we want to sell more units? So that we can make more products! This was one thing that happened with our crowd early on, where we asked what was important and they said, “Well we want a lot of attributes, conversations and depth, etc,” and they’ll put visuals at the bottom. But as soon as we ship the game, the first thing they complain about is any visual problems, and the graphics. It’s always there, even if people won’t really admit it. Do you think the renewed success of classic isometric RPGs is simply a current trend in gaming or an inevitability? Fargo: I don’t see these going away; clearly we have tapped a nerve. I think Larian Studios has had the most success, I think they have sold over 1 million copies of Divinity: Original Sin, and I don’t see any end in sight. Clearly they are a fun experience and I don’t see that dropping off; the only reason they ever went away is because the publishers wouldn’t fund them, not because the audience didn’t want them– that was the whole premise for us wanting to do this. They’ve never gone away. We just had a moment where there were people like myself, and Obsidian, who wanted to make the games and we had a whole bunch of consumers who wanted the games, but then you had either a retailer or a publisher standing in our way. Thankfully, digital got rid of the retailer and crowdfunding got rid of the publisher; now we are back in business. Either some significant confusion going on, or Fargo wants to pull the release date forward. Last edited by Lix on February 1st, 2017, 9:58 am, edited 1 time in total. Lix wrote: Either some significant confusion going on, or Fargo wants to pull the release date forward. Not to disparage inXile's project management, but sticking to a schedule is not something they're great at. Whether it's printed on the page of a magazine or divined from pig entrails, projected release dates don't even register on my retinas any more. Today we're pleased to announce that we have teamed up with IndieBox to bring you a special PC collector's edition boxed copy for Wasteland 2: Director's Cut! This limited edition comes with a special set of items - we'll be revealing them in the coming days. sear wrote: This limited edition comes with a special set of items - we'll be revealing them in the coming days. I assume that one of them will be the weapon stripping fix that was announced in March 2016. According to the vision doc, it seems that the Rangers never recovered after their HQ (Ranger Citadel) was destroyed at the end of WL2, so the move to Colorado is more like a complete migration rather than an expedition. As far as I understood the Rangers sent some guys to CO to get new technologies/weapons the patriarch talked about in his broadcast to get back on their feet. You go into the right section (for example Wasteland 3) and click the "New Topic" left side close to the top. Yep. 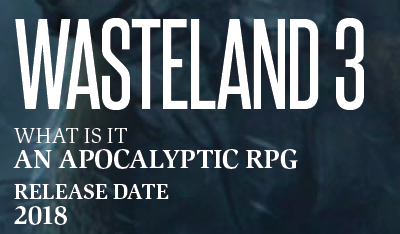 Although... That option doesn't appear for regular members in the Wasteland Series News & Announcements thread. So if that's where they looked, it would not be there.